A Lifetime of (awkward) Conversations. This past week, my daughter kept asking me when I was going to ‘Kevin’. It took me a minute (or several days) to figure out that she wasn’t talking about my gay lover, but rather, heaven. She was asking me when I was going, how long I would be there and if she would eventually be invited. After I picked up the pieces of my exploded head from the kitchen floor, I realized that this was ‘one’ of those potentially awkward conversations that you’ll encounter as a parent. Another one is about alcohol. As I’ve mentioned several times before, I’ve committed myself to a worthwhile initiative, #TalkEarly sponsored by The Century Council, which recently re-branded itself as FAAR, The Foundation for Advancing Alcohol Responsibility. Earlier this month, I participated in a Twitter Party hosted by Dr. Michele Borba, an internationally recognized expert and author on children, teens, bullying, parenting and moral development. She’s also a motivational speaker, national media contributor and spokesperson. By the looks of this infographic, I’m not too far off. So I made note of a few of Dr. Borba’s suggestions and thought I’d share them with you. 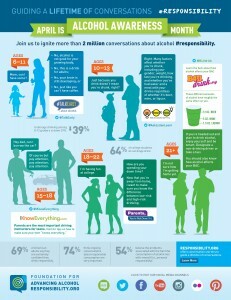 When it comes to talking to kids about alcohol, honesty is the best policy. Once our kids catch us in a ‘lie’, we lose their trust. 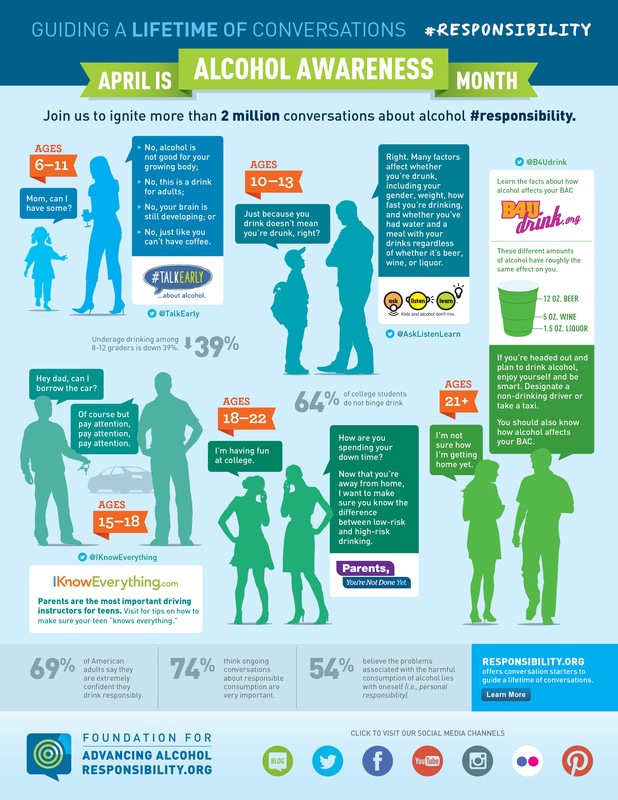 The earlier we talk to kids about alcohol, the better. Beliefs are formed at a very early age, as early as 6 years old. When talking about your own experiences, the trick is to tailor your response to what your child can handle and what you want to offer. You can divulge part of your background with alcohol and leave out the more extreme details. 44% of parents of 6-9 year olds think that drinking in front of their kids has little or no impact on their attitude towards alcohol. Listen actively to your child – don’t just speak. Look for chances to ask your child what he or she thinks, an opportunity for them to open up. All of these quotes feel important. I wholeheartedly agree that we need to ‘listen’ to our children and find opportunities to create a safe environment for conversation. I also agree that while honesty is the best policy, I do need to leave out the ‘extreme details’ of my relationship with alcohol. Do my kids really need to hear about the time I passed out on the 18th green at my friends country club wedding reception while my buddies took turns taking pictures next to me with their pants down? Do they need to know that I once fell asleep on the toilet in my college dorm for six hours? And do they really need to hear about how I got my tongue pierced after stumbling off a booze cruise in Cancun over spring break? If you haven’t done so already, join the conversation by following FAAR on Twitter and Facebook and seriously, also tell my boyfriend, Kevin. « Lucky in Love…and Pizza + Dr. Oetker Giveaway! That conversation can be awkward. Thanks for the tips! Great post, I have a teenage daughter and a pre-teen son so these are right on target for me.